were ad hoc and manually implemented with e-mails, spreadsheets and SharePoint. Start small, think big, scale fast was the underlying approach at adidas. Bizagi was chosen to deliver automation and workflows across various departments including supply chain, marketing, finance, retail and eCommerce. 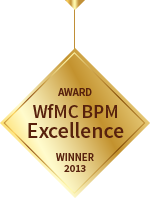 The highly successful BPM initiative reduced the time to market by two thirds when compared with the traditional in-house development.